I designed the game to simulate the experience of the football fan. Of the two versions in the book, that is what the Zeppelin Edition is for. Other than using your Grid Iron Points (you get 3 each half) the game mostly runs itself. 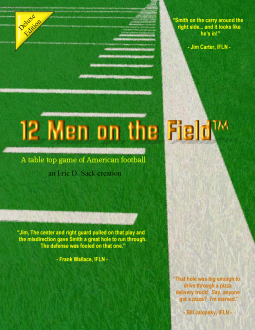 Each play, including kickoffs, runs, passes, field goals, two point conversions, etc… are all conducted by the offense and defense rolling dice and comparing the results. The dice will determine how many yards are gained or lost, if there is a penalty (or offsetting penalties), broken tackles, sacks for a loss, incomplete passes, plays that go all the way to the endzone, etc… All the things I love about football is packed into those rolls! The number of plays per quarter are determined by a standard deck of cards. Each side, offense and defense, draws a card for most plays. When you run out of cards, the quarter is over. Certain face cards can affect the play. The Standard Offense table is used to determine what play is called, based on down and distance. Grid Iron points are used when you don’t like your coache’s play call, or to add dice to your play roll. You get three each half. The Sideline Edition follows the same rules, but you become the coach! Each coach gets half the deck of cards from which to call plays, running and passing (by color of suit, as well as audibles…). There is an advantage for calling a run against a pass defense, or a run defense agianst a run offense if your card is higher. Strategy for the coachs, but your team must still execute. The same dice are rolled: touchdown runs, penalties, the works. The Delux Edition also includes rules for league play, including simulating stats and wins and losses for those teams not represented by actual players. It also outlines the teams and some of the history of the International Football League (IFL). This is a fictional football league played in the US and Canada I created for the game. This is where the penalties are. And it makes a very attractive center piece for family gatherings on Sundays. I would also recommend felt on the bottom of any tokens that you use for markers on the Official Field of Play. It is glossy poster quality and can be scratch by coins or glass game tokens.